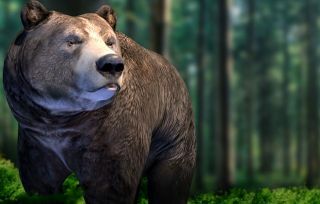 Bear Sim creator John Farjay says he's sorry for the negativity, and has some ideas for the future. Back in early March, Bear Simulator developer John Farjay said he was putting the game on ice, because it “didn't have a great reception” on Steam (although user reviews are actually "very positive"), he didn't feel sufficiently skilled to improve it, and he was tired of putting up with all the drama. “Can't ignore it because that causes more drama,” he wrote, “and can't do anything about it because that causes more drama.” But now it seems that he's changed his mind. The first sign that he hadn't entirely given up on the game appeared in early April, although he clearly still regretted the decision to release the game on Steam. But he added the “Kickstarter Island” that was promised in the crowdfunding campaign, made some tweaks and fixes, got the Backer Credits in place, and even offered a look at a new area he was working on called The Campgrounds—although the “sneak peek” was really just a small, square picture of grass. Farjay also said he has ideas for a “swamp region that will have a frog storyline,” and hopes to update the game's website as well. Most interestingly, though, is that multiple game companies have reached out to him about porting Bear Simulator to consoles. “A few other companies offered to make toys/stuff for this game” he added. "Might b cool 2." It's not the most tightly-scheduled update I've ever seen, and there are clearly miles to go before he sleeps—" Have no friggen idea what to do with Steam community stuff, like zero," he wrote—but it's nice to see that Farjay hasn't given up.